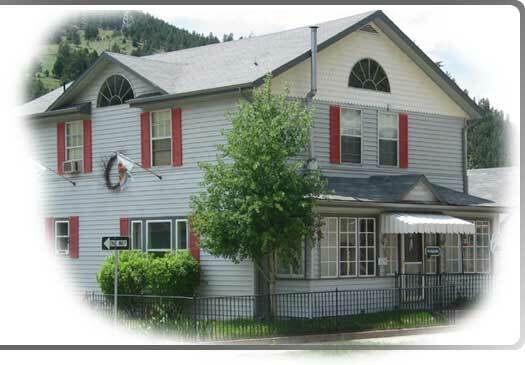 I'm home from my delightful, delicious overnight stay at the Miners Pick bed and breakfast in Idaho Springs. Here is everything that I did. I drove up to the mountains, leaving my house at 2:30 and arriving at the bed and breakfast at 3:30. It felt charming and welcoming as soon as I walked in. I chose the room I wanted, the prettiest one, of course, or at least prettiest in my opinion: see above. 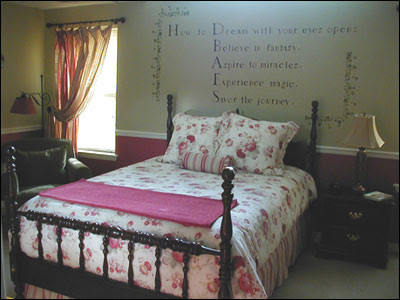 I loved the quote stenciled on the wall above the bed: "How to dream with your eyes open." I established myself cozily in the little common room and read an entire doctoral dissertation for a defense I'm attending in the College of Education next week; the dissertation is on the alleged" boy crisis" in education. I read the recent newsletters from the Authors Guild and the Society of Writers and Illustrators. I read the fabulous first chapter of Little Bee by Chris Cleave, which I had borrowed from my friend, Rowan. Then it was time for dinner. I strolled down the one inviting little commercial street in Idaho Springs and bought myself two bars of lavender-and-oatmeal soap at a soap boutique. Then I dined at Mangia, a lovely Italian restaurant a few doors down. I ordered myself a glass of Pinot Noir, which I enjoyed with their wonderful, warm fresh-baked bread, followed by a perfect salad and stuffed shells filled with spinach and cheese. Back "home" again, I put on my nightgown and actually graded ten midterms: yes, I did bring them with me, and it felt so good to make progress on them as a kindness to my future self. And then I read another amazing chapter of Little Bee before I fell asleep. This morning I arose at six, made myself some tea, and wrote Chapter 37 of my novel. Breakfast was at eight, just me and Vicky, the world's most hospitable innkeeper: cranberry-pomegranate juice, a small bowl of cut-up watermelon and kiwis, and the most attractive and delicious eggs Benedict I have ever seen or eaten. And then I packed up and drove home, about as completely content as a person can be. As if I haven't been having enough joy in my life lately, I leave tomorrow after teaching my second class and having lunch with a favorite grad student to drive up to Idaho Springs and spend the night at the Miners Pick bed and breakfast. This is the treat that I won for myself in my church's silent auction a couple of weeks ago. Oh, this is going to be bliss, bliss, bliss. I'm going all my myself. I'm taking my book-in-progress with me, hoping to get at least one chapter written and maybe two. I'm taking a whole stack of books to read - after all, I'll have part of an afternoon, and a whole entire evening, and then a whole entire morning. Even though I could definitely use some of that time on grading my midterms, I am planning to leave that little pile of work at home. I have heard that the breakfasts prepared by innkeeper Vicki are amazing, so expect a report when I return. The good of writing my books by hand, with my clipboard, narrow-ruled pad of white paper, and Pilot Razor Point fine-tipped black marker pen, is that I can write them so cozily anywhere. I can write in the airport while I'm waiting to board the plane; I can write on the plane cruising at 35,000 feet; I can write lying in my bed in a motel room in Warrensburg, Missouri; I can write in a new friend's charming guestroom while listening to her play her original compositions on piano and hammered dulcimer; I can write by a kiva fire in Taos; I can write in a crowded French patisserie in Santa Fe. The bad of writing my books by hand is that when I come home from all this cozy writing I have to type up heaps and heaps of pages of my nearly illegible handwriting. Usually I don't mind typing up my chapters after I finish writing them. It gives me an opportunity for a round of revision as I go, changing a word here, a word there, eliminating repetition, adding a needed transition. But usually I do this a chapter at a time. I wrote six chapters during my spring break travels. Typed, this will be around 50 double-spaced pages. That is a lot of typing to do, especially when I'm on fire to write more new chapters - I'm so close to the end of the first full draft of this book, with maybe just another six more chapters to go. But I need to stop writing today and start typing, or else I'll be facing the need to type 100 double-spaced pages. Besides, my handwriting is so truly illegible - more of a shorthand than actual cursive - that I can't even read it myself if I wait too long; I can read it only because something about those squiggles on the page triggers a recent memory of what I actually wrote. So today that's what I'm going to be doing: typing, typing, typing. I haven't actually worn them yet. 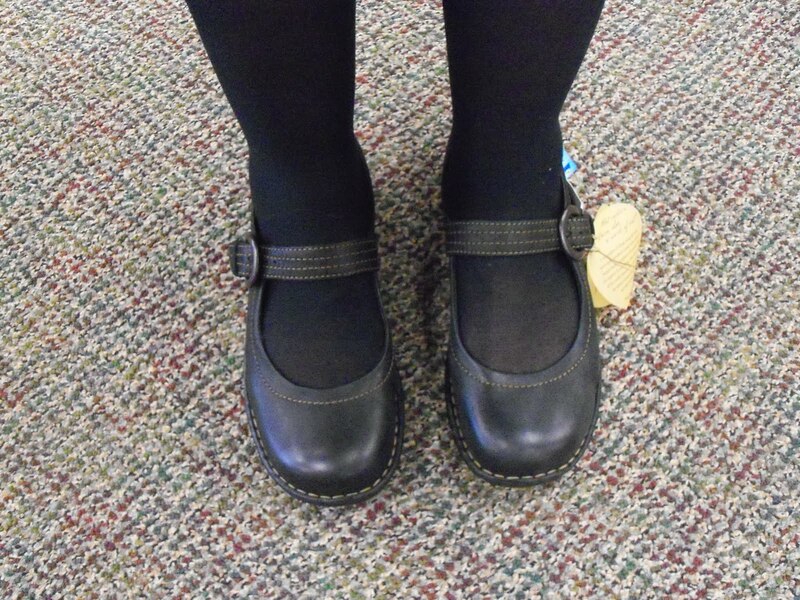 I buy new shoes so seldom that it creates somewhat of a sensation in the Philosophy Department if I appear with a new pair of shoes upon my feet. "You got new shoes!" comes the chorus of voices. So maybe I'll make that sensation when I return from spring break to teaching tomorrow. Or maybe I'll save them for the start of my "new life" for April on April first. Either way, I'm very pleased to have them. New shoes! I'm back from my blissful day with the children at Chapel Hill Elementary. I spent the whole day with a group of some 35 children who had earned the privilege of "lunch with the author" by reading books, writing book reports, and generally demonstrating that this opportunity meant a lot to them. So I had an audience of extremely motivated fourth and fifth graders. It was a busy day. I presented my standard author talk, complete with finale of the ape dance. I led a writing workshop on the theme of "show, don't tell," complete with performances from willing children who mimed the emotions of shame, joyful pride, and anger, so we could decide how best to describe these in our writing without labeling them explicitly. And I showed a PowerPoint of photos of my childhood, of writing-related trips, and of illustrations from my books. The very best part of the day, though, was waking up in April's guest room at 6 a.m. and then writing a chapter of my book while listening to her play her original compositions on the piano in the other room - it was like being in our little artists' colony of two. And second best was writing my poem for the day on the plane coming home. The festival was wonderful. It is always wonderful. This year I'm lucky enough to have my book The Totally Made-Up Civil War Diary of Amanda MacLeish on the master list for the Mark Twain Award, Missouri's children's choice award, which means that thousands of schoolchildren all over the state have been reading my book. So my audiences at the festival were larger than usual. There is always such great adrenaline and energy in speaking to bigger audiences, and I had fun sharing my stories with them of how I became a writer, culminating as always in the performance of my "famous" ape dance. I bought not one, not two, but THREE pairs of shoes at the festival shoe-buying party at Brown's shoestore in downtown Warrensburg: one pair of street shoes, one pair of house shoes, and one pair of boots. I, who love to travel unencumbered with the world's smallest and lightest suitcase, am now dragging with me a huge shoestore bag stuffed full of shoes. One of the festival authors took a picture of my feet in the new street shoes - photo to come once she arrives back home and emails it to me. Now I'm at the home of April Armstrong, the librarian at Chapel Hill Elementary School in Gladstone, Missouri, where I'll be speaking tomorrow. April is not only librarian extraordinaire, but a passionate musician and composer. She plays hammered dulcimer, piano, violin, to name a few. Her home is filled with musical instruments, quilts, and cats. Right this minute, she is playing a haunting original composition on the piano, with a cat on her lap, as I type this blog post on her computer, with a cat sitting on the modem. I'll be home tomorrow, but right now April's house feels like home. It's now officially spring break, and tomorrow morning at 7:52 a.m. I'll be on the bus to the airport to fly to Kansas City and then ride to Warrensburg, Missouri, to attend the Children's Literature Festival sponsored by the University of Central Missouri. I've lost count of how many times I've gone - fifteen? At least a dozen. The festival takes place during their spring break, which this year also falls during our spring break at CU. The whole campus is turned over to dozens of authors and thousands of school children, arriving by the busload from schools within a three-hour radius of Warrensburg. Each author gives four talks a day; each group of children gets the chance to hear four authors a day. It's intense and wonderful. The most fun is reconnecting with the other authors, who come back year after year as I do. 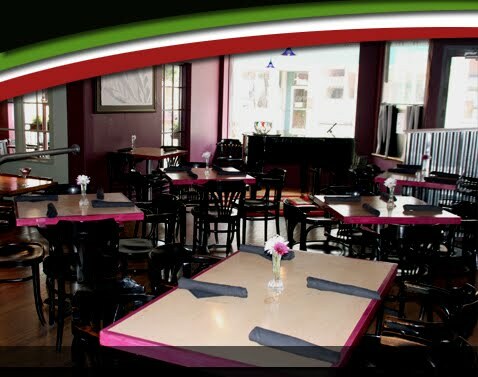 We'll have dinner the first night at Heroes, in downtown Warrensburg. The next morning we'll take a long walk to look at cows, followed by a luncheon and book signing/reception. Monday and Tuesday we give our talks. Monday after the talks we'll go buy shoes at an old-timey shoe store downtown right near Heroes; this has become a festival tradition. That night we'll have dinner catered for us in the university library. Then on Tuesday I'll leave to go spend Wednesday speaking at Chapel Hill Elementary near Kansas City, and then I'll fly home. With at least one new pair of shoes in my suitcase. Last weekend my church had a fancy (well, fancy for us) dinner in the fellowship hall, together with a silent auction, as a church fundraiser. I contributed two items to be auctioned off: a basket of my books, with fifteen different books in the basket, and an author visit to a school or Scout troop. Both attracted a gratifying number of bids, with competition especially keen for the basket, so much so that at the end of the evening I ended up offering three more similar baskets for the losing bidders, all going at the wining price, with all proceeds to go to the church. It was one of those win-win-win-win moments. The person who did win outright was so happy to get the basket, but felt terrible that others had lost in the bidding; now she has the fun of the basket without any need to feel sad for her bested competitors. The others got the same item to enjoy, and the two families with young children are going to come to my house after church one Sunday soon to pick out their own selection from my book cupboard: a make-your-own-basket outing. The church gets four times as much money as it would have gotten from only one basket, and also vastly more than it would have gotten had I offered four baskets in the first place, for then each one would have gone for the minimum bid of $50 instead of for the competitive bid of $115. And I get to clean out my book cupboard to make room for my authors' copies of all my new books that are coming out this year and next - five of them times fifteen author copies for each one. I'm getting rid of 60 books to make room for 75 more. So: hooray! But even better is what I won myself at the auction: a night at the Miners Pick bed and breakfast in Idaho Springs, owned and managed by the pastor's finacee, Vicky. I have never been so excited in my life about winning anything. I am going to go up there all by myself one night midweek, after spring break, and curl up in that supremely cozy spot and write, write, write. And I've heard from reliable sources that the breakfasts are amazing. Oh, I cannot wait, just cannot wait! Of course, I'll post all about it afterward. Yay for a wonderful silent auction! I've been working on a series of answers to interview questions posed to me for the Writing and Illustrating for Young Readers workshop for which I'm serving on the faculty this June. One of the questions is: What do you feel are some of the best strategies for inspiring children to write? I've been pondering that one, when today I stumbled on the most wonderful answer in the world. I was down at Cafe Solle near my house this morning, meeting one of my SCBWI mentees for a critique session on her manuscript, when who should come into the cafe but many many children - at least two dozen of them. They were dressed in tye-dyed shirts and wearing hippie beads, some with bandannas tied around their heads; they were all carrying notebooks and pencils. After they ordered their beverages and cleaned the cafe completely out of every pastry in its display case, they scattered themselves around at the little tables and began - writing poetry. I inquired: this is one Mesa Elementary School third grade teacher's annual poetry-writing class trip. The children are encouraged to dress in "beatnik" garb and then to come sit in a cafe to write. All around me these third grade poets were sipping their hot chocolate, nibbling on their croissants, and writing poems: the Parisian Latin Quarter crossed with 1968 San Francisco. If there is any better way to make children want to write, I don't know what it is. I may go back there now with my novel and get myself one of those croissants, except that they're all sold out. I'm inspired just from watching this morning's glorious celebration of writing. I hope you're inspired just by reading about it. If there's one thing I know how to do, it's how to structure the week before spring break. In both of my classes - my large lecture freshman-level Intro to Ethics class and my smaller sophomore-level class in political philosophy - we are having midterms this week. So Monday was a review session for the exam in both classes, and a very helpful review session it was, if I do say so myself. Today we have the midterm. And on Friday? Well, on Friday, we won't have class, as many students will already have departed for spring break, plus we all need some recovery time from the midterm and just some time for mid-semester catching of our breath. I'm also trying to clear my desk of various other projects so that I can turn my thoughts to spring break unemcumbered. I'm finishing up a batch of five book reviews for Children's Literature, meeting with a mentee to discuss six chapters of her novel-in-progress, writing up classroom observations for my TAs, and writing up answers to interview questions for two profiles - one for the SCBWI summer retreat for which I'm serving as leader/facilitator and one for the Writing and Illustrating for Young Readers workshop in Utah for which I'm serving as faculty. And I made a Powerpoint presentation to show at a school in Missouri, which asked me to have some visuals to share with the children (well, I hired a fabulous grad student to come to my house and make it for me). Oh, it is so satisfying to be crossing all these things off my list, with spring break lying ahead. Of course, the downside of doing the midterms the week before spring break is that now there will be midterms to grade during spring break. But they will go fast. And I'll also be away in Missouri for part of the time at the Children's Literature Festival sponsored by the University of Central Missouri, with a school visit to follow. Still, above all, there will be time during spring break to do what I love best in the world: write. I have now, in my capacity as judge, observed five prize-nominated classes over the course of the last two weeks: Photography for Non-Majors (studio art), Drugs in U.S. Society (sociology), Cartography (geography), French composition, and an advanced acting class in the theater department, which I attended yesterday. In the acting class, the students spent the hour in a movement exercise. Put into pairs, with the person who is also their partner in a scene they're working on from Hedda Gabler or Orpheus Descending, they had to walk around the room, at first in a seemingly random way, but later on with more and more precise instructions from the teacher, while keeping in character for their role and reacting to their partner's movement. It was fascinating. I kept writing notes. This instructor, Emily Harrison, was one of those teachers where every utterance from her lips was worth scribbling down on my pad of paper, and trying to apply to my own work as a writer and to my whole entire life. Her first instruction: "This is not a thinking exercise, it's a doing exercise." That made me remember the advice cited by Rebecca Stead in her Newbery acceptance speech last year for When You Reach Me: "Don't think!" And it's actually how I've been writing my current novel, with much less thinking than in my previous books. I'm not thinking it, I'm just doing it. In every scene in a play, Emily told her students, keep focusing on the question: "What does my character WANT?" Excellent writing advice, that. And how is this for brilliant writing/life advice. As the students progressed in the exercise, which seemed at first to be going on too long, but then it seemed that the length of the exercise was precisely part of the point of it: "If you start thinking you are falling into a pattern, start doing the opposite. See what it feels like to make a different choice." Oh, Emily, I have fallen into so many problematic patterns! I need to make so many different choices! Or: "Play with tempo. What is your character's internal tempo? Keep in mind that people in positions of power tend to have a slower tempo. The world waits for them." Hmm: my internal tempo is fast, fast, fast! Or: "Don't be afraid of stillness. Stillness is beautiful at times." And this wonderful closing line: "Human beings are notorious for automatically creating narrative. We are narrative-creating creatures." I love lines like that. I love classes like this one. And I love having a job where I get paid to attend them. My plan to prioritize poetry in my life this year has now become a maniacal craze. The problem started when I discovered that I write best while something else is going on, preferably a dull philosophy department colloquium talk. But then I started writing during interesting talks, and then during important talks... It's gotten so that as soon as a speaker stands behind a podium, lines of poetry leap into my brain and my fingers start tapping out the rhythm of lines in iambic pentameter. This week, I wrote two poems while I observed a prize-nominated class in Geography. I wrote a poem while observing the recitations led by my terrific TAs for my Intro to Ethics class. I wrote a poem during the spectacular opening night talk by philosopher Charles Mills at the Morris Colloquium. Now, I did also pay attention to the class, and to the recitations, and to the lecture. But I have to confess that my attention was somewhat divided. Yet, what can I do when I sit down, and all of a sudden, as if hypnotized, I start writing. I write a sonnet almost every day. I've come to think in five iambic feet. And it's true. That IS how I think these days. Oh, well, at least I am writing a lot of poetry. And I apologize to every speaker who has had me as a member of his audience. I am obsessed with two projects these days: 1) writing a complex and ambitious older middle-grade novel; and 2) writing poetry, poetry, poetry. Although there is absolutely no reason for me pose this question to myself, I did ask myself this morning: which one do I love best, and why? Or, maybe: which one is more satisfying, and why? Novels are big. Because a novel is big, it's daunting to begin it. But then because it's big, once begun, one can continue happily in its world for dozens of chapters (I'm going to write Chapter 29 today), for months and months. Every day, at least now that I finally made my plan for what is going to happen next (which I didn't make until I was well past the groping halfway point), I can settle down cozily and just write another installment - though lately the installments themselves are fairly gripping, with the swath of destruction following from certain initial events widening by the hour. I have momentum. All I have to do is to keep going. In some sense the novel is now writing itself. Poems are small. Or at least mine, and all the ones I like, are small. I have a commitment to write one every day. Because they are small, from the time I conceive one to the time I finish it is fairly brief. And because I write so many, I can be profligate with them - dashing them off with great jollity, knowing that I can always return to revise them later, but for now, I'm sowing poems through the universe, or at least my little corner of it, with a free hand. With constant completion, there is constant satisfaction. But then every day, I do have to generate an idea; that's the hardest part, coming up with the idea. But, writing a poem every day, in such merry abandon, I don't feel that it has to be all that great of an idea. My novel is under a contract to a publisher. That gives the writing of it a certain urgency. In some sense it is work. But it is work I love beyond all telling. Still, I know that at some point the novel will be critiqued by my writing group and by my editor, praised or panned by reviewers. There is some standard out there in the world to which I need to measure up. My poems are under a contract to my poetry buddies, but it's a contract I can unilaterally break at any time. One of the three of us just decided to take a poetry hiatus for a few weeks; I could do that, too. Heck, I could take a poetry hiatus for the rest of my life. My poetry buddies do send me some comments on my poems, and when they say, "Wow, I'm in awe!" it feels better than when they say, as one did today, "I don't think I'll remember this one as I do some of your others." But still, I'm writing the poetry more just for me than I'm writing my novel just for me. Of course, the answer to this kind of question - "Which do you love better, x or y?" - almost always turns out to be "Both, in different ways." I guess that's my weaselly answer here, too. I love writing big things, I love writing small things, I love writing under contract, and I love writing for the sheer joy of putting words on the page. So now I'm going to go write my poem. And then I'm going to go write Chapter 29 of my book. I'm now moving into the time of the semester where I have the opportunity to indulge in my hobby of playing student. As a longtime judge of the Graduate Teaching Excellence Award, I'm going to be sitting in on classes in disciplines including studio art, anthropology, French, all taught by graduate student instructors nominated by their departments as outstanding teachers. When I go, taking notes in diligent student style, I'm always on the lookout for not only excellent presentation of the material and successful engagement with the students, but also for little piercing and beautiful insights that I can take with me in living my life. The latter is not a criterion I use in judging the award, it's just something that makes my time in each classroom more meaningful. I like the feeling of being on a treasure hunt, a scavenger hunt for scattered bits of brilliance. Yesterday evening I observed a photography class for non-majors taught in the Visual Arts Complex. It was wonderful. The students have an assignment to create a series of self-portraits focusing on "identity." To begin the class, the teacher presented work of some of his own favorite photographers who had done self-portraits, such as Arno Rafael Minkkinen and Cindy Sherman. I loved seeing their work through his eyes. "There's millions of 1/25s of a second out there." "This photo is not worth a thousand words; it's worth a thousand questions." In the assignment given: "Be whatever you want to be. You have authority over your own self-portrait." I want to get a camera now! And even if I don't, in my writing, in my novels and my poetry, I want to be on the lookout for the most significant 1/25 of a second - I want to write a thousand words that are worth a thousand questions. And maybe I CAN be whatever I want to be, at least in my own self-portrait. My trip to the Association of Practical and Professional Ethics conference was in every way wonderful. I have to confess that I went to only three sessions for the entire two days of the conference: the session at which I was speaking, the session at which my former grad student and next-year DePauw colleague Jen was speaking, and the keynote address (and I wrote my poem for the day during the keynote address). 10. Had not one, not two, not three, but four pomegranate martinis in the hotel bar. I call that an excellent conference indeed. When my sister and I were little, a year apart in age, we had a favorite game, if you can call it a game, called "Personal Business." We each had something called a pegboard box: it was a wooden box about the size of an 8 1/2 by 11 pad of paper, with a sliding cover that had little holes in it - that was the pegboard. Inside the box had originally been the pegs, and you were supposed to use them to make peg designs on the cover. But at this point in our childhood, I don't know where the pegs had gone. All we had were the two boxes. Into each one we'd each put whatever we wanted to "work" on that day: something to write, a book to read - I'm not sure what other kind of thing it would have been - maybe one of those potholders to make with cloth loops on one of those little metal loom? Then we'd take our pegboard boxes and climb back into our beds and work on our "personal business" happily for hours. That's how I feel when I start out on a short trip for work, like my trip to Cincinnati today for the Association for Practical and Professional Ethics conference. My backpack is my pegboard box stuffed full of appealing little projects to do on the plane. In mine right now is my work-in-progress on my novel, of course, and the book I'm reading for my book group this month - Unbroken, by Laura Hillenbrand - and another book I'm reviewing, and a colleague's manuscript to read, and three essays I'm judging for a university writing contest, plus the special notebook where I write down my goals and dreams. The fun of the trip starts the instant the bus to DIA pulls away from the Park and Ride, and I take out the first tempting item from the stash and launch into blissful hours of "personal business." In two hours, the game of personal business will begin! Tomorrow I leave for Cincinnati to attend the annual conference of the Association for Practical and Professional Ethics, a conference I have attended 18 times over the last 20 years. This is the 20th year anniversary of the conference, and I've missed only twice. It's a joyful occasion for me to hear some stimulating papers, but also to connect with beloved former grad students who first attended the conference under my chaperonage and are now all grown-up and coming with grad students of their own. This year I'm not presenting a paper, but giving comments in an Author Meets Critics session on a book called The Ethics of Parenting by Norvin Richards, newly released from Oxford University Press. A lot of my own philosophical work has been in this area - I've written papers on issues ranging from the rise of the use of Ritalin and other behavior-modifying medications for children to conflicts between parents and non-parents in the workplace - so I was pleased to be invited to read Richards's book and reflect on it. But the best part of the conference will be the pomegranate martinis with Sara and Chris in the hotel bar of this beautiful art deco hotel, the Netherland Plaza Hilton, on the National Register of Historic Places. Oh, I hope they have them again this year! But even if they don't, I imagine that I can find some palatable substitute. And Sara, Chris, and I will talk for hours and hours and hours, listening to the piano player's schmaltzy selections. I can't wait.